Wool Quilt and New Stitchery Progress! Bunny Candle Mat from a Freebie! Yesterday we headed to Connecticut for a change of pace and since we were headed in that direction, I couldn't go without visiting my favorite prim shop, Milltown Primitives. 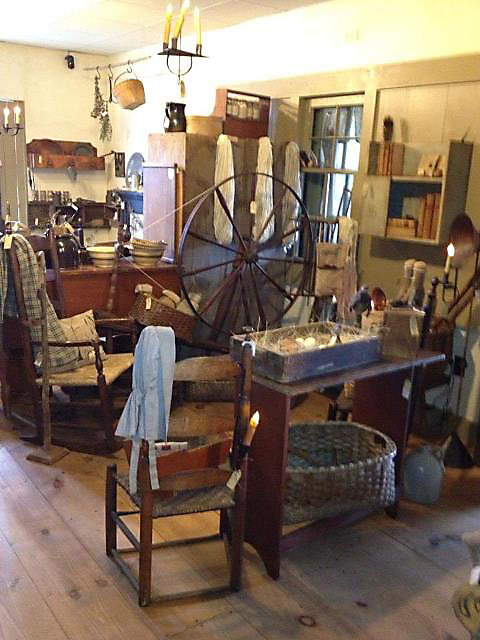 The store features five rooms, each one decorated in 18th century reproductions and antiques. It is like visiting a museum, each room is set up like a room in a home and there are so many wonderful pieces that I walked around and around, seeing something new each time. 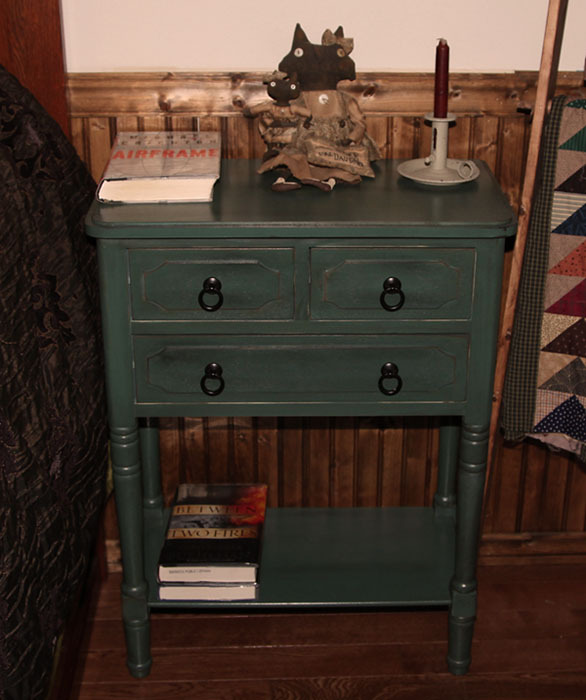 Robin is a wonderful host and her husband is part of the team who makes wonderful reproduction furnishings. Robin is also an accomplished cross stitch designer who was featured in Early American Life and is thinking about starting up her line of patterns again. She was kind enough to give me one of her iron on designs to try, so I will be working on that and feature it in a future blog posting. 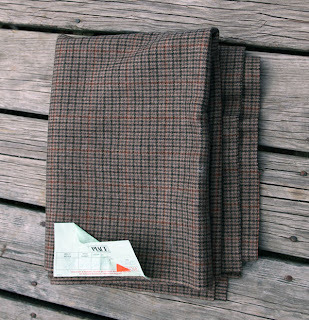 Her designs are done with iron on patterns, so perfect for those of us who have poor eyesight and love to work on linens or osnaburg. Here is one of the larger rooms and this is just a section. I am bad at shopping, I tend to refrain from buying too much for myself, but I thought I deserved a treat this week and when I saw this banner, I just had to get it. 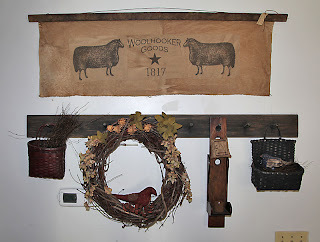 It is made by a local artist and of course, it is perfect for a textile artist;) I need to redo my peg rack, and today I threw up the wreath and added some dried florals to it, so later I might make an old dress or sack, things to hang on the rack. 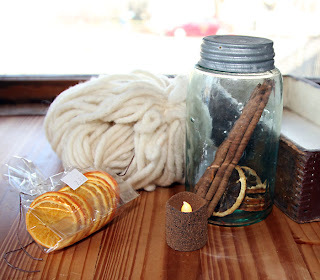 And here are the rest of my goodies, one item is not mine, but I have been looking for one and I wanted to grab it while I could;) The yarn is hand spun, prefect for my needle felting projects. If you are ever in the area, Milltown Primitives is a must, on your places to visit. I send blessings and well wishes to all of you this Easter. Today was truly Good Friday. It was a beautiful day and I was having a good day, health wise. A day like today is when I truly feel blessed. We went for a ride down the back roads to the prim store, that will be the second part of my post tomorrow. 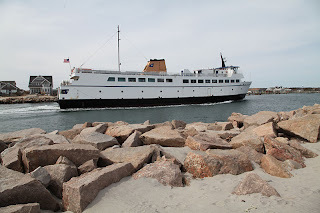 Then we went to Stonington Connecticut. It is a town on a peninsula and filled with historic homes that line the streets, which are so narrow, we had to pull over to let others pass. 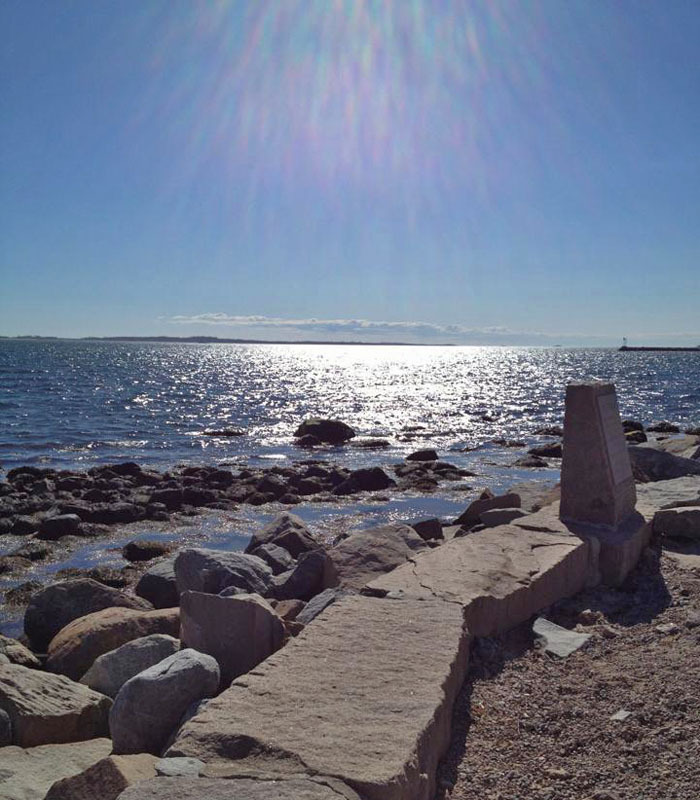 But it was well worth the drive down the narrow streets to get to the point, for a view of the Atlantic Ocean. I took this photo with my iphone and noticed the rainbow of light coming down from the top, truly ethereal. 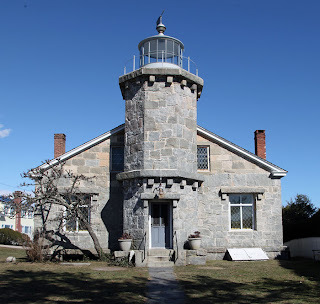 There is also a lighthouse museum, but it isn't open till next month. 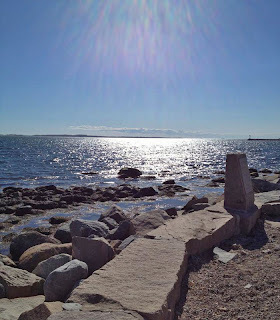 After enjoying our visit at the Connecticut ocean, we rode back to Rhode Island and took a walk at the bird sanctuary. 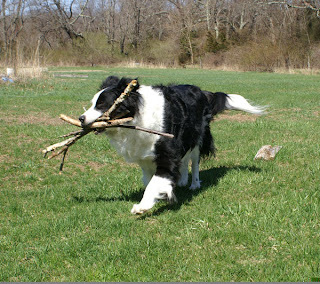 It was a bit windy and cool, but it was a nice brisk walk. Before we left the Stonington area, I saw a thrift store, of course I had to stop. I found a couple of yards of wool from one of the stores that closed a few years ago, only 3.00 for new wool, not bad. It is a tan brown, but looks grayer in the photo. 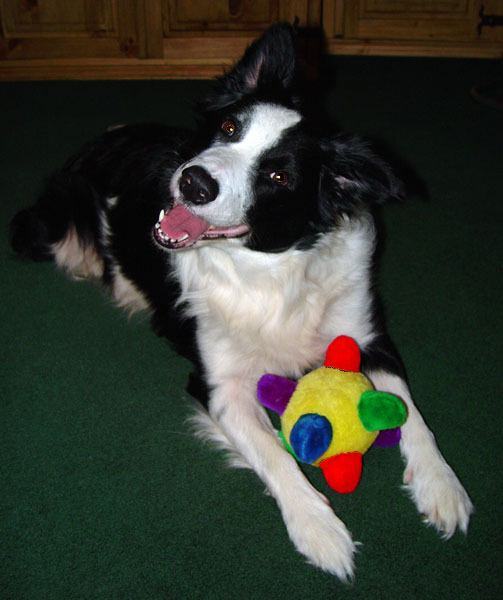 I am touched by all of the wonderful comments and outpouring of your loving thoughts. I truly appreciate each and every one and it warms my heart to know that I have the support and understanding of so many friends. Today I worked on my wool quilt. I have sewed most of the blocks, just an edge left to do on one piece and one block of pennies. I plan on doing a little extra embellishing and stitchery on some of the pieces, then I will sew on the back and maybe a black binding. 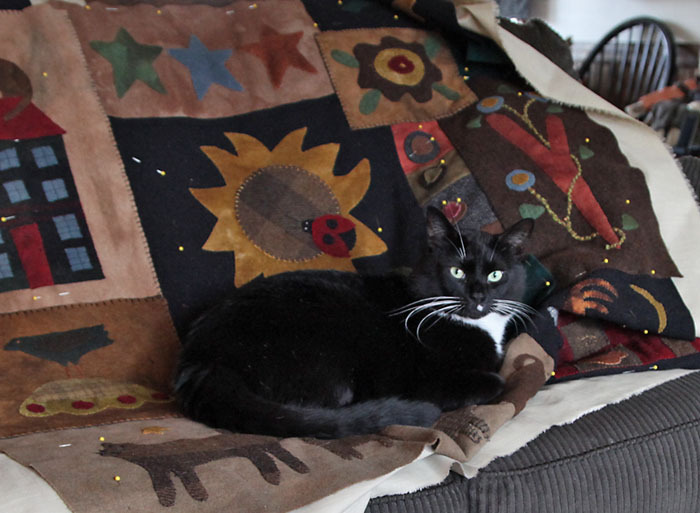 Moki never sits with me or on the couch, but today, he tried getting onto my chair or actually the quilt. He did not care if it still had pins in it, it is wool and kitties love wool. When I laid it on the couch to take a break, he was there within seconds. Now he is on it again, sleeping soundly and comfy without the pins. Today I played around with my wool pieces until I got a layout, that I liked. 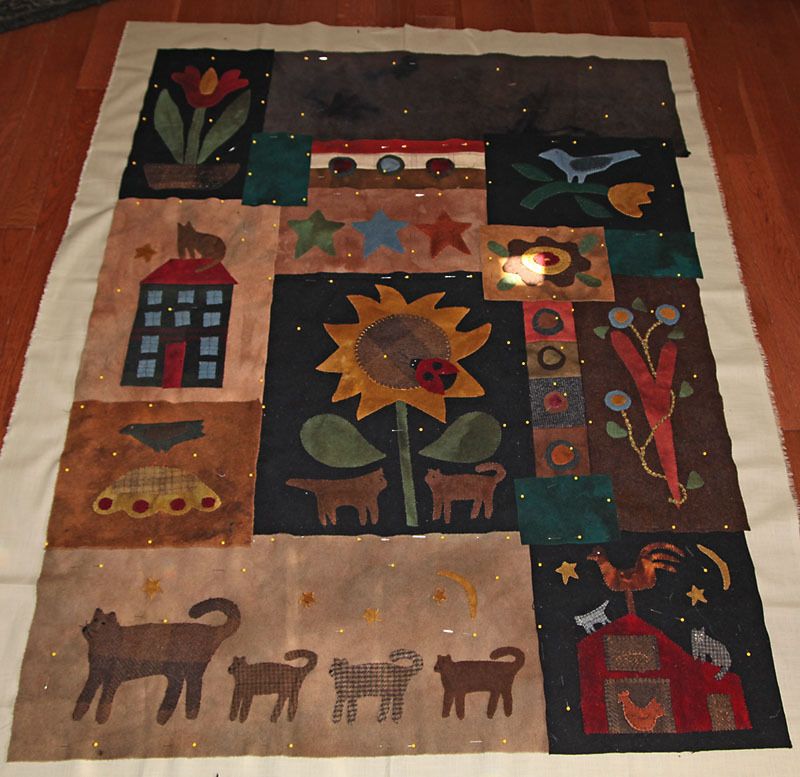 I had some spaces so I added a patchwork and a striped block and at the suggestion of a follower, some pennies. I also added the green blocks and the plan is to stitch words on those. I am doing a blanket stitch to keep it simple and easier than trying to do too many stitches on one big piece. I did a little bit today and got tired so I grabbed my stitchery to work on and what did I find underneath, a kitty block that I had set to the side. Now I need to rethink how that will fit in, but I am sure I can redo the top area and shorten the long piece. I added the longer piece and planned on making the applique later, which is good, since I will change that out to fit the kitty in. Another project I am working on is a stitchery called Blackbird Sings which can be found in Kathy Schmitz's book, Simple Pleasures in Redwork. 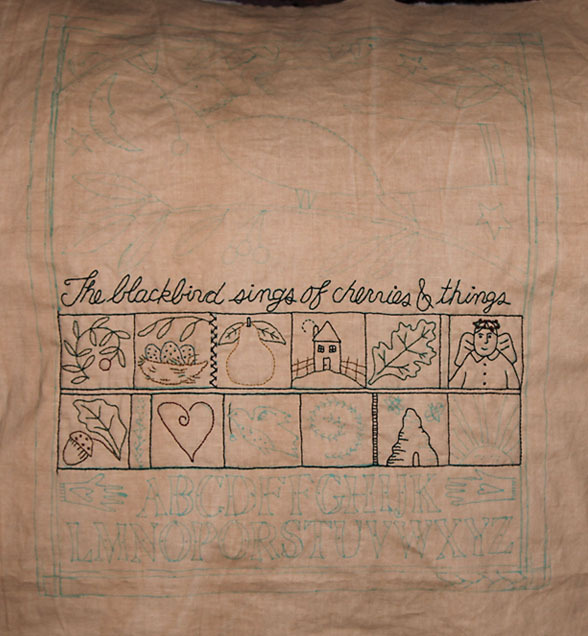 After I find the stitchery, there will be a border and it will measure 23" x 26", the largest stitchery I have done but perfect to hang for spring and summer. The original is done in lighter colors with a touch of black, I am going with black and a touch of color. Contest and Freebie this week at Babycakes Blog, be sure to visit and wish her a Happy Anniversary! I decided to take out one of my unfinished projects and finish it, my wool quilt. I had a few things to sew down and some stitchery to add faces and windows, and finished that. Then I laid it out on the backing I am using for it. 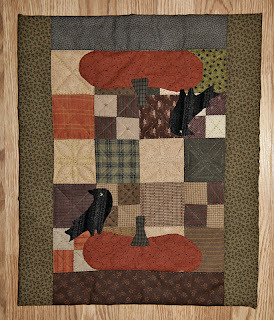 My original plan was to make the blocks, then sew scraps of wool together to fill in the spaces. 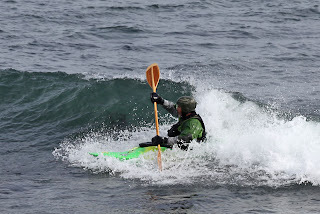 But, I have no idea what layout I had to do that, makes no sense to me now, lol. So, I need to rethink it, maybe make a few more blocks and still do some fillers. I am thinking that, instead of sewing the pieces together, I might work it as a crazy quilt. I can use a scrap piece of backing and lay the pieces down and then add wool and overlay it to the back and stitch it down that way. Something to think about and mull over. The blocks were done with various patterns that I have in books, you will see a bit of Jan patek in a few of them. 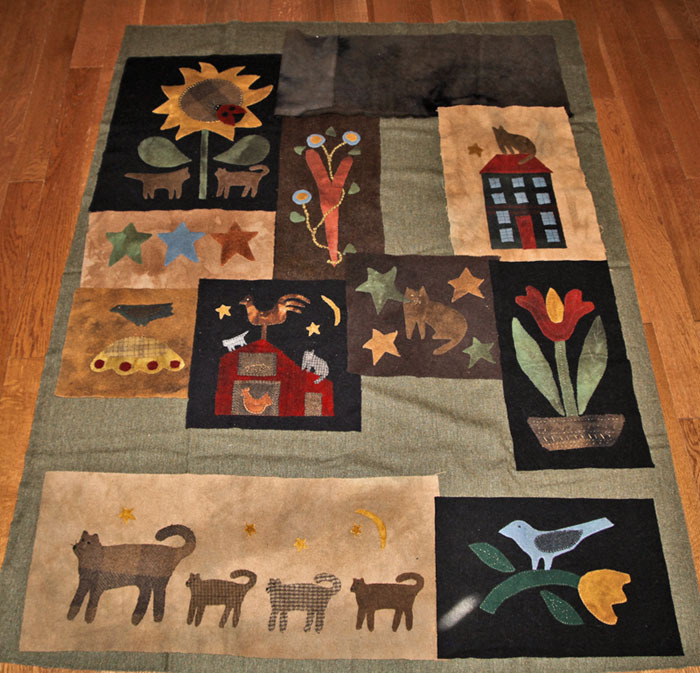 It is a fun way to make your own quilt, pick out appliques that you like and make them into one quilt. Any suggestions or ideas, are appreciated! 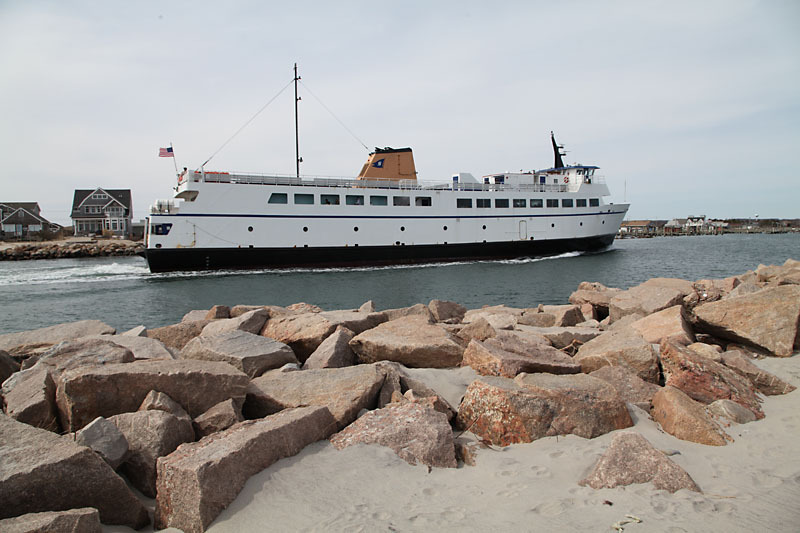 We got to watch the ferry, as it came in. 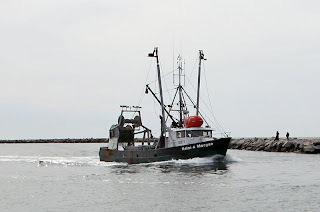 Followed by the fishing trawlers. 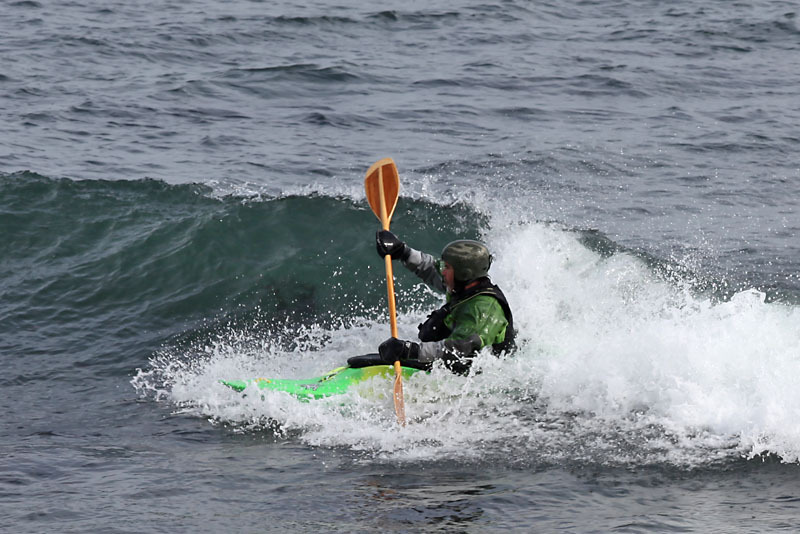 I love to kayak, but this is a bit much for me and way too cold. A perfect day to get out and enjoy seeing what the rest of the world is up to. There are a lot of places to find free designs on the web and one that I visit often is Flickr from Yahoo. There are a few groups that offer free designs and if you do a search, check out Vintage Embroidery Patterns, where you can find this wonderful design. 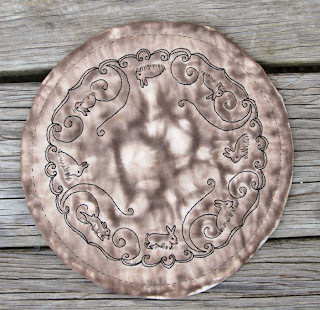 I made mine into a candle mat and antiqued it, perfect for a quick project for Easter. I used a round plastic lid that was a big larger than the design and traced the circle onto white muslin with a blue washable marker. I centered the design into the circle and traced it with my light box. This week I wanted to get out and went to my favorite consignment store. They sell items at thrift prices for a lot of things and always fun to see what goodies they have. I haven't had time to make any rabbits of my own, so this one was perfect to sit on the chest. 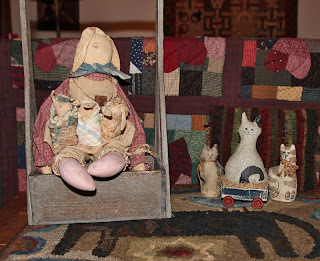 I love the raggy clothes and the baby bunnies she is holding in old cutter quilts. The kitties I found in a bag and there is another white one, but not prim. Two are signed and one is from Bucks County, so had to get them, at least for the prim two. The only thing I didn't like on the bunny was her pink feet, so maybe I will antique them;) The kitty on the right says D. Paumen, or Pallmen, anyone you know? 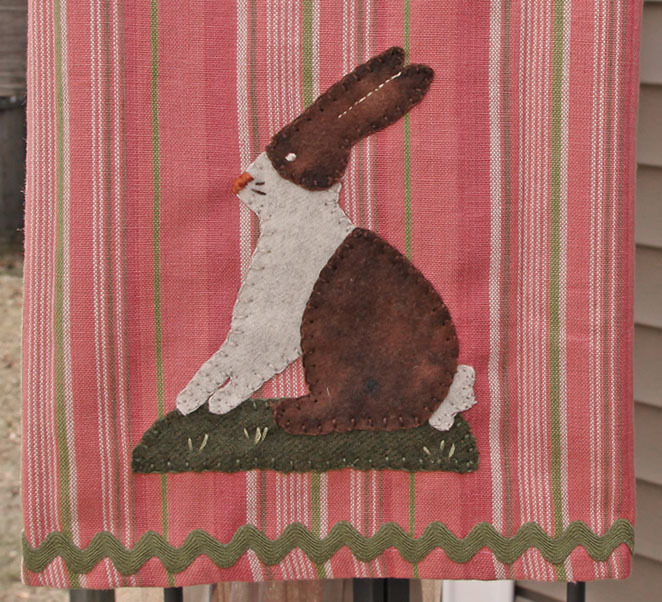 One of the other wonderful gifts that I received from Buttermilk Basin's giveaway was a tea towel and a bunny design to applique onto it. She also sent the rick rack and thread to use with it, but I forgot I had the threads and used my own. I love the colors in the towel and I used my hand dyed wools for the bunny. I love how it came out and how it looks hanging in my kitchen. 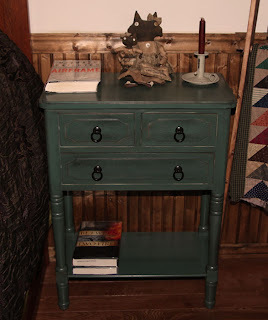 I have a pale sage green on the walls, so it looks beautiful against that color. I just wish I could have gotten a better photo to show it off. Here is how it looks hanging on one of my racks in the kitchen. 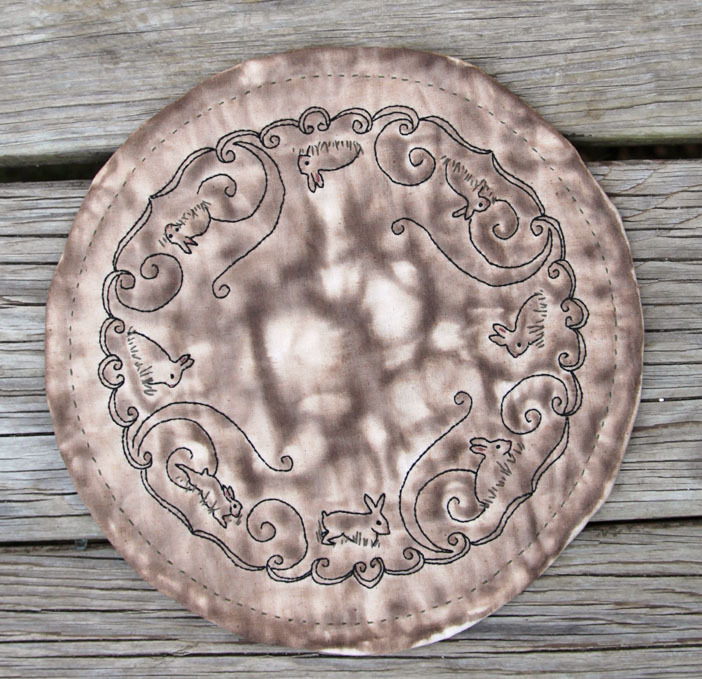 Here is a little closer look, so you can see the dyed browns, love how they look on a piece like this. This week I also found a new freebie that I thought you might like to do. 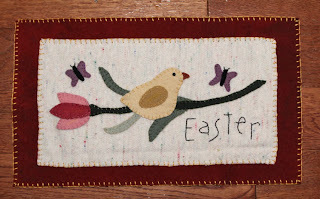 It is from Badbird's and it is a beautiful design that would look nice as a mini quilt. 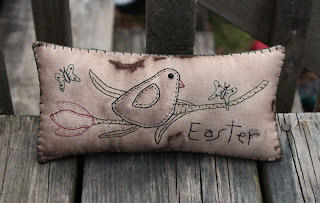 Today I finished a pillow with the spring chick design that I won from Stacy of Buttermilk Basin. It is a fun design to do and since it is longer, I reduced it a bit to make a pillow to put in front of one of my wood boxes. For this piece I used a white muslim and then antiqued it. I also added a little extra stitching and outlines, then I did a blanket stitch around the outer edge of the pillow. I am not sure, but I think the new batting is causing the stains to pool in one spot. 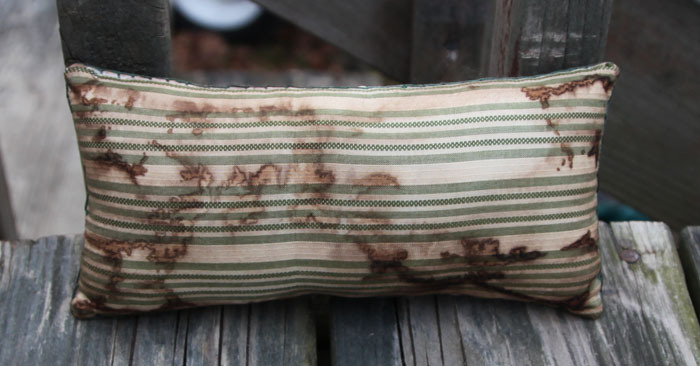 And her is the back, I used a green homespun and you can see how the stain pooled in spots. I was thrilled to get my giveaway gifts this week, just in time for the holidays. My husband is going to help my son with the electrical wiring in his new room, so I thought I would make them a little gift for their new home. 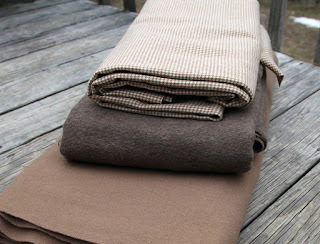 I used the wools that Stacy, of Buttermilk Basin, sent me for the pattern and my own wools for the backgrounds. The kids like new and bright things, so no dark fabrics or aging on this one. The piece was small, so I added a larger background so they can use it on a little table. The blanket stitch was done in gold, but of course the flash made everything look brighter and shiny. I thought the white wool with the flecks of pink and blue were perfect for this project. I had another small piece that my friend Kelley sent me, and it reminded me of autumn. I hand stitch the top with lana wool thread, starting out with a design and then decided it was easier to do a basic stitch in the ditch with an X in the middle. 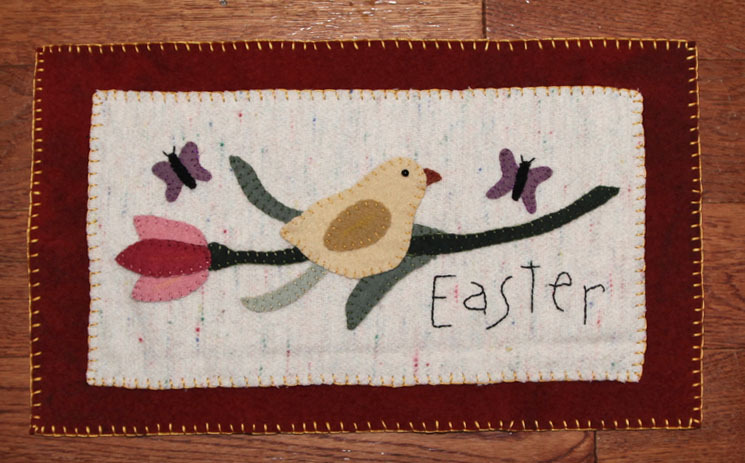 I wanted to add applique, so it was silly to do anything that will be covered up by the appliques and since it is a table topper, it will have something on top. 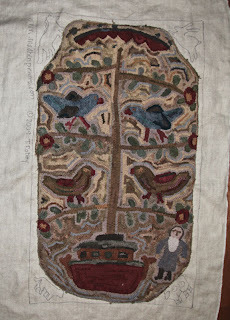 I used appliques from two different books by Jan Patek. I liked the pumpkin in one and the crow in another. I kept it simple and like how it came out, something nice to use for fall. The chalk marks still show, I need to rinse it off. A nice surprise today was a package from Stacey of Buttermilk Basin. I was one of the lucky winners of one of her giveaways and today I received my wonderful goodies. 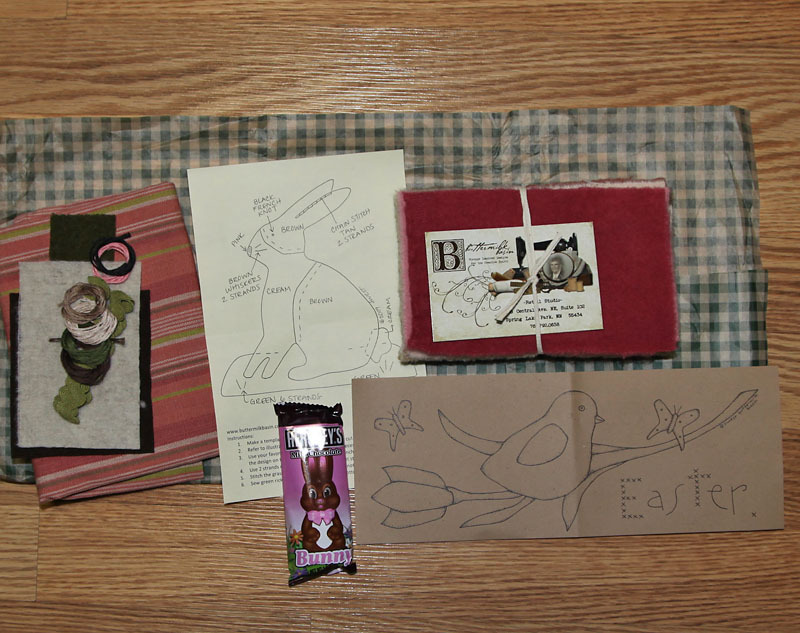 I love what she sent and just in time for Easter. 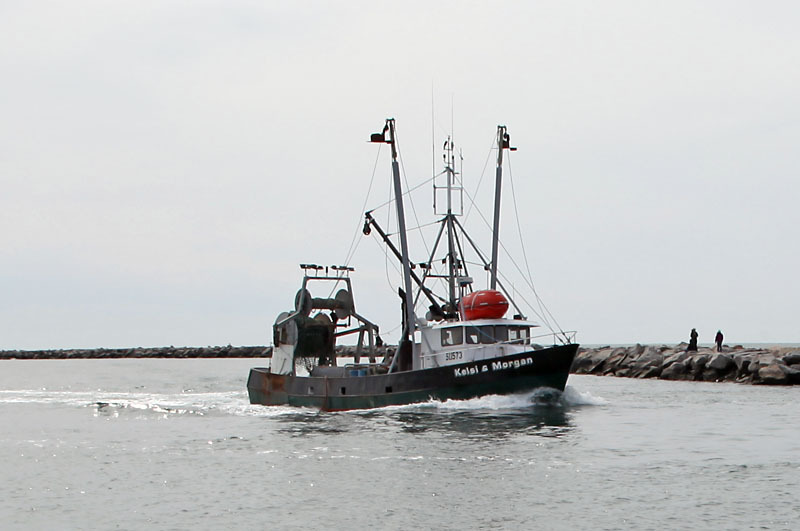 We have a storm heading our way tonight, so perfect timing. I can work on these two projects and have something new to decorate with. She even sent the wools and threads for the kit. 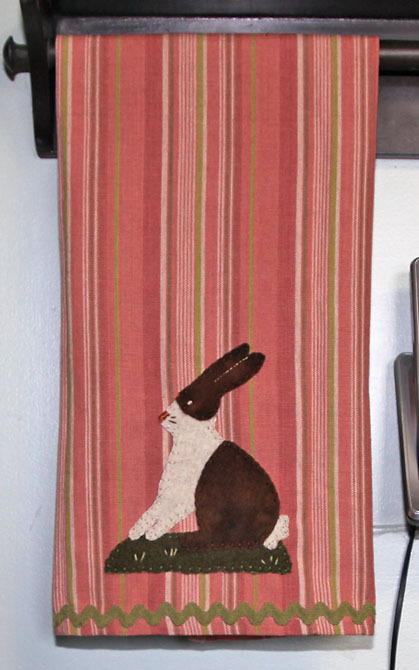 The striped piece is a dish towel and I will be putting the bunny on the end, I just love that. 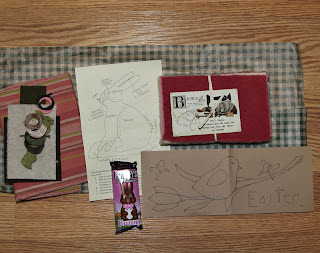 She even sent me a little Chocolate bunny, a really special treat for a dreary day. I have been working a bit at a time, on my rug and finally finished the middle section. This was a kit from Mad Hen Primitives that was gifted to me by a friend. I love being able to hook without having to worry about picking colors or cutting the strips, just enjoying the process of hooking and watching the design evolve. The bad thing is, I ran out of background colors and had nothing that matched her strips, so I just added what I had. The flash really popped out the colors, so hard to see how it looks in a photograph. Now all I have to do is the outer animals and a dark border background. I do have the strips, so I hope I don't run out, but it is easier to match up darker wools. My friend Cyndi who gifted me this wonderful rug is down sizing her stash and has a lot of wonderful patterns for sale on EBAY right now, if you want to take a look. 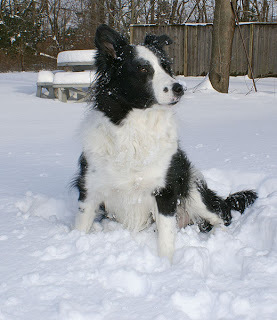 It got up to 40 degrees today, a warm spell, lol. A good day for a ride and browsing the local stores by the beach areas. We have a thrift store called The Johnny Cake Center. It is a small store but packed with goodies and today I lucked out. They had bins filled with a lot of home fabrics, but I dug through and found wool on the bottom. The tan is a thick blanket wool, great to back wool quilts with, the darker brown is a felted wool on one side and thick wool on the other, great for felted projects or maybe even a teddy bear. 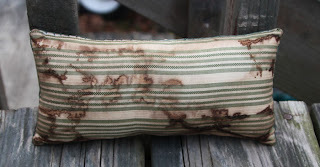 The last piece I found is a nice check, a bit thinner but it should full a little more when I dye it and that will work nicely as penny backs or for pillows. There is about 10 yards total and I got it for 9 dollars, but we gave a little extra to help out. The money goes to help the families in the area. Then I dug through the back area, they had a sale table and look what I found underneath. Three wool yard sticks, perfect for a yard stick project. 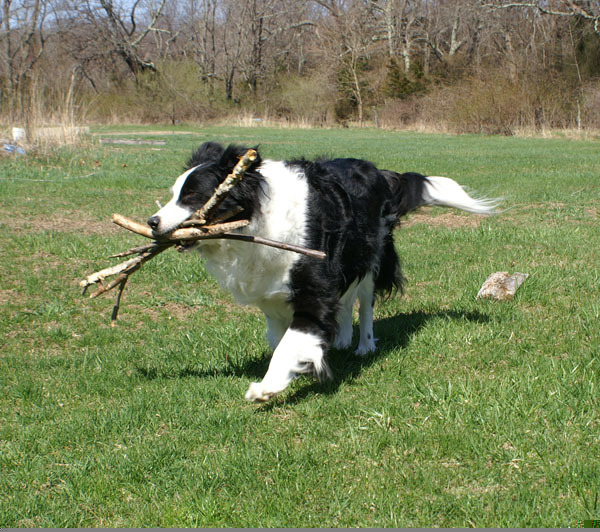 I have seen a lot of fun projects and things you can make with yard sticks, so I grab them when I can find them for a good price. A total of .50 for all three, of course I thought they were worth a little more and it is a good cause. I needed a new table for my bedside and the black one I had was the perfect size for Bill, next to the couch, so today I found one I liked. It is new and more prim, than it looks in the flash glare. This one is taller and I can put my library books underneath and have room for my extras in the drawers. I always like to keep pencil and paper nearby in case I get an idea. So, a good shopping day, I found some things I can use and something I needed at a good price. Then we got to enjoy a ride around the coastal road and enjoy the views from different points.